A substantial sized feeder is good… because you simply don’t have to fill them as often. In general, hopper feeders tend to be on the larger size, while tube bird feeders usually hold less seed. This is okay if you don’t have much bird traffic, but right now it seems everyone is fattening up for fall and the yearly migration to southern climates. This tube bird feeder is way cool, just the way it looks is pretty darn groovy in itself. I like it because it holds four pounds of seed, and is hand crafted i the USA. Super quality means it will be around for many seasons, and it’s made in two styles; for black oil sunflower or thistle seed. When the perches are all full… it’s really a pretty impressive site to behold. 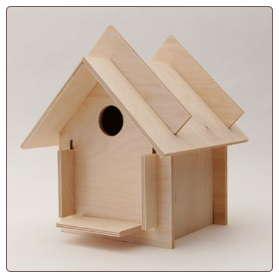 Finches, Chickadees, Titmice, Nuthatches, and other small songbirds can be seen at a tube bird feeder. This past summer, we were lucky enough to see a few Indigo Buntings at the tube bird feeder in our yard. 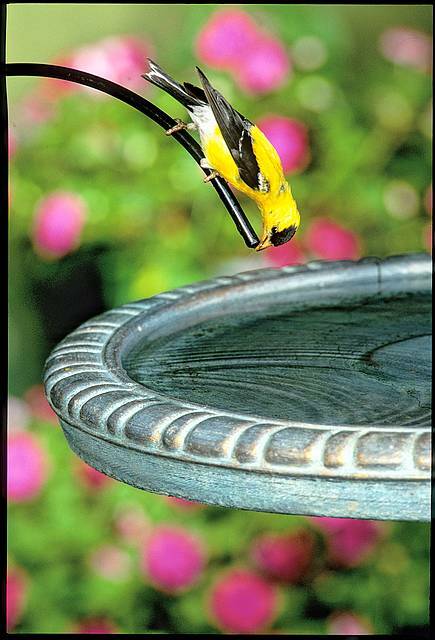 As always, a fresh water source, such as a bird bath will always entice more birds than any feeder itself, especially with the severe drought in the Southeast. You can help migratory birds by keeping feeders full and fresh, offering suet and fruit, and a fresh water source in your yard. Something as simple as a large plant saucer filled with water can serve as a birdbath and oasis for many feathered friends! SAN FRANCISCO, CA – More than 41,000 people have joined a viral campaign on Change.org calling on Google to remove KG Dogfighting, a dogfighting game created by Kage Games, LLC, from the Android Market. Robert Pregulman, author of the Seattle DogSpot blog, launched the online campaign after reading reports claiming that Google had responded to the public outcry against the dog fighting game by temporarily pulling the app. KG Dogfighting has been condemned by law enforcement officials and animal advocates alike. Activists have called on Mr. Davidson to review KG Dogfighting, but he has not responded to further inquiry. With the fall migration under way for many birds, Goldfinches are one of the few species who will actually stay put… especially if you have finch feeders in your yard. Although their vibrant yellow plumage will soon begin to fade and wither with their second molt of the season, these sweet songbirds are full-time residents in most of North America. Aside from being one of the few who experience two molts in the same season, they are also one of the latest breeders, raising nestlings in late summer through early fall. Because of this, you’ll find finch feeders busy with activity this time of year. Babies are fed thistle (or nyjer seed) almost exclusively. Because of hot, humid weather, seed tends to spoil rapidly, so it’s best to change and clean feeders frequently. If finch feeders are not being emptied quick enough by the birds, don’t fill them all the way. This three-tube finch feeder’s innovative design distributes seed more evenly, so it’s less likely to spoil. Just because that yellow plumage disappears, your finches won’t! Continue to fill your finch feeders throughout the year, and offer a fresh water source for these and other birds. 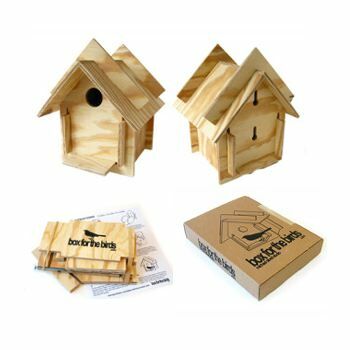 Creating a wildlife friendly habitat will keep finches around the whole year. squirrel baffle… baffle, baffle, baffle! So many folks will mutter: “I can’t feed the birds because of the squirrels”. It’s pure rubbish, nonsense I tell ya! The pesky critters can be foiled so easily and permanently with the use of a good squirrel baffle. This one-time, relatively inexpensive purchase of a good baffle really will solve the problem of squirrels raiding bird feeders. So you have a shepherd’s hook that the squirrel baffle won’t slide over? Ridiculous! 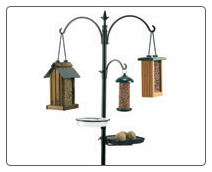 They make a great pole-mounted baffle that will go on any kind of bird feeder pole. It’s innovative cone-shaped design actually opens up and separates to go around the pole, then attaches back together by hooking one end into the others’ locking lip. It’s a powder coat metal, so the squirrel baffle stays looking nice for years. I just spray painted one that has to be twenty-some years old! Should you desire a feeder mounted on a 4×4 post… no worries! 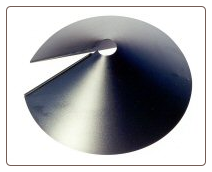 An attractive baffle is also available for mounting on wood posts. So, there’s absolutely no reason to let squirrels ruin the enjoyment of backyard birding. 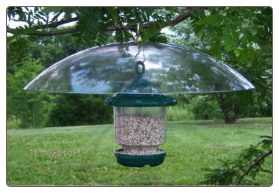 A good squirrel baffle, be hanging, pole, or post-mounted will foil squirrels once and for all… the birds will thank you too! WASHINGTON, DC – More than 2,000 people across the U.S. and Canada have joined a campaign on Change.org, started by a California resident concerned by the collapse of a Ringling Bros elephant in Anahaim, Calif., calling on the USDA to remove the ailing animal from the circus. Laura Goldman, an animals blogger and California-based activist, launched the campaign on Change.org after seeing the video of Sarah, the 53-year-old elephant, collapsed on the ground beside a Ringling Bros boxcar. Just two months ago, the USDA cited Ringling Bros for violating the Animal Welfare Act by failing to treat Sarah’s chronic medical problems; meanwhile, the circus boasts that the sick elephant has never missed a performance. In less than a week, more than 2,000 people have signed the online campaign on Change.org, the world’s fastest growing platform for social change. Animal Defenders International has already filed a formal complaint on Sarah’s behalf and the growing support from people across the continent adds to the pressure on the USDA to act. Protesters are planning demonstrations at upcoming Ringling Bros events in California and other locations. While the feeders containing finch mix are absolutely mobbed… thistle feeders appear to have no customers these days. Thistle (or nyjer seed) is kept fresh, as these feeders do not sit too long without changing the seed. Goldfinches have one of the latest nesting seasons, and chicks are fed thistle seed almost exclusively – so it seems strange to me that the thistle feeders are just about void of any birds? There are lots of electric yellow Goldfinches in the yard right now, but they seem to prefer the finch mix, and the birdbaths! 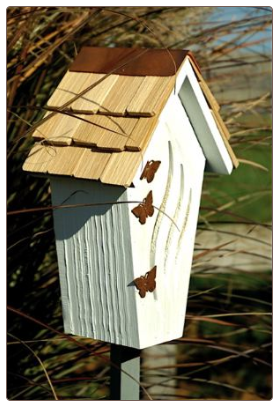 While we use a pretty standard thistle feeder, these Wave Thistle Feeders are on the wish list. 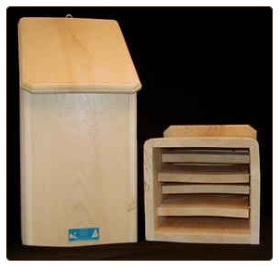 High quality, hand crafted thistle feeders that are made in the USA. What a groovy design! They’re also made for dispensing black oil sunflower. Goldfinches will molt soon, as the fall migration gets underway. It happens to be their second molt of the season… one of very few wild birds with two molting processes in the same year. Olive-drab and browns will soon replace the vibrant yellow plumage, but these birds will stick around if habitat is good. 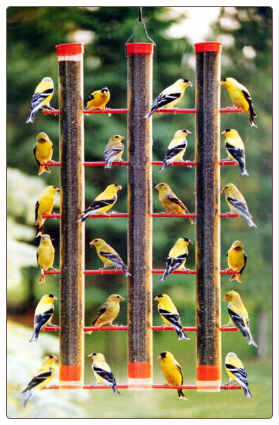 So keep thistle feeders fresh and full to provide goldfinches a steady diet, and keep these sweet songbirds in your yard year-round.